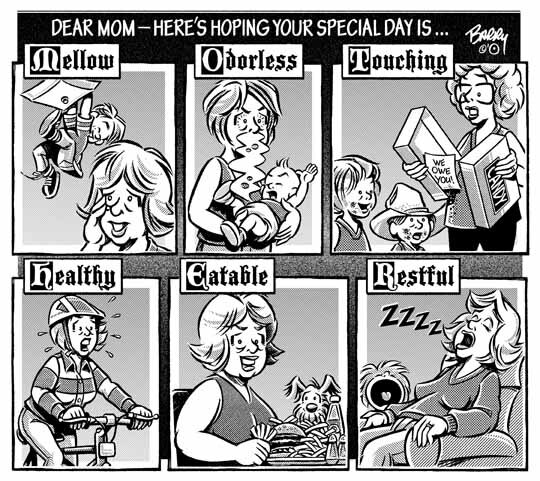 Here's the first of two MOTHER'S DAY cartoons for you. I've gone with this one because it offers so many different views of Mothers in action. Once you have a good look at the toon, you're likely to agree that most Moms out there will easily identify with ALL of these views. HA! In this Category, you'll find cartoons that span virtually the full gamut of MOTHER'S DAY experiences: From Mom & the kids blissfully joyriding on the family 4-wheeler, to a couple of toons featuring highly unusual gifts for Mom — one thanx to genetic engineering & the other due to the thoughtfulness of a very practical hubby.